We were in Kelantan a few weeks ago, for a colleague's wedding. It was nice! Kelantan was nice, albeit the old-looking buildings, the uneven roads and the super packed places. Driving around Kota Bharu felt like a whole new, strange city - as if we were in some other country. 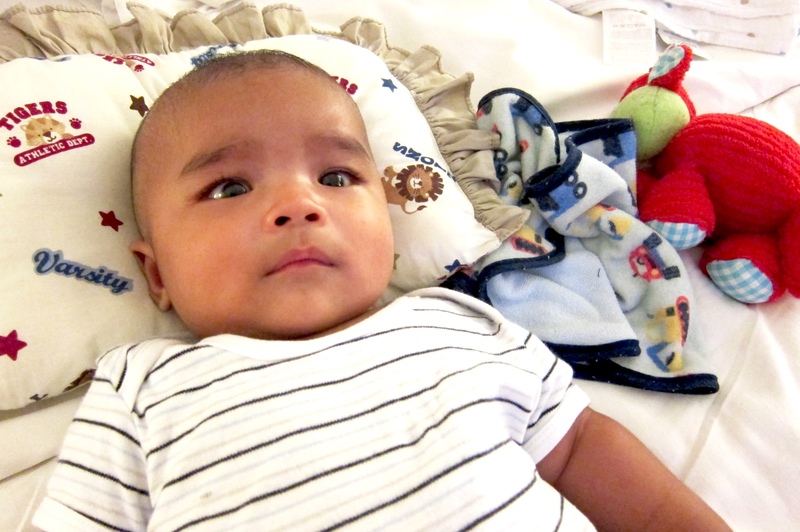 When we weren't looking for places to eat, days were spent in our hotel room, entertaining Rayyan. At the time, he was just turning 3 months old - and what I've read from BabyCenter is that babies usually have growth spurt during the transitional periods, which includes this one. His demands were ridiculously more than usual. More feeding time, more napping time, more resting time - and when he's active, he's so restless I was practically praying for God to put him to sleepy mode. Stayed at Perdana Hotel, Kota Bharu. Got a decent room overlooking the swimming pool. You might not see it in the picture, but it was really packed with people. 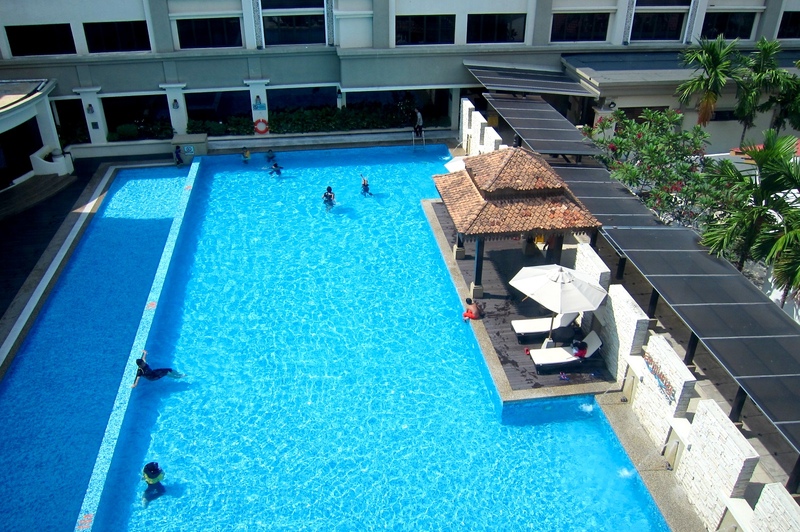 Breakfast time was an agony because we kept bumping into wet-clothes kids who've just been in the water 10 seconds before (the restaurant is located right beside the pool) so the floor was so slippery, I was so afraid I'd slip with Rayyan in my hands. So we kept using the stroller the entire time. What a hotel room with a baby looks like. 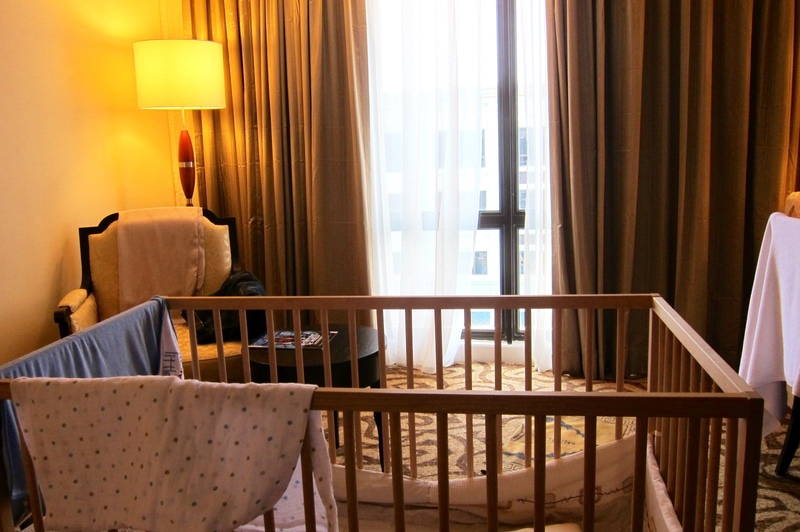 We requested a baby cot for Rayyan and were lucky our room was spacious enough to fit one. Though Rayyan ended up spending most of his time on our bed -_-"
Had mostly Kelantan food, including nasi air here. It's actually bubur nasi, or similar. Went to Bazaar Tok Guru to look for some new telekung as I heard from my colleagues that it's really cheap there. Turned out true as they were selling telekung everywhere! So I got myself 2 new sets of telekung for Raya lol. New resolutions? To use premium telekung more often as regular telekung tends to get dirty easily - especially when used outdoor during outings and sweats and stuff. Felt really bad when I realize I have mostly decent-looking and premium standard clothes to look proper for masyarakat, when I should've done the same (if not better) for my alone time with God. So yeah. To more new and well-taken care of telekung in wardrobe for the future! Visited Yati Ayam Percik for its famous nasi kerabu with ayam percik. Hands down, the best nasi kerabu I've ever tasted. And I'm not even that into nasi kerabu. And they have various kuih muih too; perfect for you if you have sweet tooth, like me XD Kelantan is officially my food heaven. Found this gem, too. McDonalds' ice cream in PAS colors. Didn't really notice it until the husband pointed it out. "How do they make the cones in green? And why?" "It's PAS punya colors lahh"
You know, only in Kelantan. Makan yg org jual dkt kl/selangor pon dah rasa sedap gila, nasi kerabu ori kelantan punya mmg cant imagine sedap dia mcm mana. Nanti anon nak cuba jugalah kedai tu bila pergi kelantan.